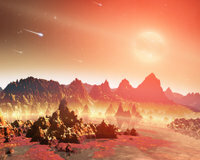 Artist’s concept of a pulsar and surrounding disk of rubble called a “fallback” disk, out of which new planets could form. About 900 light years from here is a rocky planet not much bigger than Earth. It goes around its star once every hundred days, a trifle fast, but not too different from a standard Earth-year. At least two and possibly three other planets circle the same star, forming a complete solar system. Interested? Don't be. Going there would be the last thing you ever do. The star is a pulsar, PSR 1257+12, the seething-hot core of a supernova that exploded millions of years ago. Its planets are bathed not in gentle, life-giving sunshine but instead a blistering torrent of X-rays and high-energy particles. “It would be like trying to live next to Chernobyl,” says Charles Beichman, a scientist at JPL and director of the Michelson Science Center at Caltech. Our own Sun emits small amounts of pulsar-like X-rays and high energy particles, but the amount of such radiation coming from a pulsar is “orders of magnitude more,” he says. Even for a planet orbiting as far out as the Earth, this radiation could blow away the planet's atmosphere, and even vaporize sand right off the planet's surface. Astronomer Alex Wolszczan discovered planets around PSR 1257+12 in the 1990s using Puerto Rico’s giant Arecibo radio telescope. 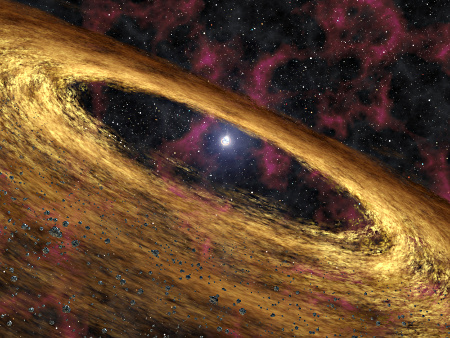 At first, no one believed worlds could form around pulsars — it was too bizarre. Supernovas were supposed to destroy planets, not create them. Where did these worlds come from? NASA’s Spitzer Space Telescope may have found the solution. In 2005, a group of astronomers led by Deepto Chakrabarty of MIT pointed the infrared telescope toward pulsar 4U 0142+61. Data revealed a disk of gas and dust surrounding the central star, probably wreckage from the supernova. It was just the sort of disk that could coalesce to form planets! As deadly as pulsar planets are, they might also be hauntingly beautiful. The vaporized matter rising from the planets' surfaces could be ionized by the incoming radiation, creating colorful auroras across the sky. And though the pulsar would only appear as a tiny dot in the sky (the pulsar itself is only 20-40 km across), it would be enshrouded in a hazy glow of light emitted by radiation particles as they curve in the pulsar's strong magnetic field. Find more news and images from Spitzer at http://www.spitzer.caltech.edu/. In addition, The Space Place Web site features several games related to Spitzer and infrared astronomy, as well as a storybook about a girl who dreamed of finding another Earth. Go to http://tiny.cc/lucy208. The Herschel Space Observatory has 3.5-meter primary mirror, allowing astronomers to see colder, darker celestial objects than ever before. Exploring the universe is a bit like groping around a dark room. Aside from the occasional pinprick of starlight, most objects lurk in pitch darkness. But with the recent launch of the largest-ever infrared space telescope, it's like someone walked into the room and flipped on the lights. Suddenly, those dark spaces between stars don’t appear quite so empty. Reflected in the Herschel Space Observatory's 3.5-meter primary mirror, astronomers can now see colder, darker celestial objects than ever before — from the faint outer arms of distant galaxies to the stealthy “dark asteroids” of our own solar system. Many celestial objects are too cold to emit visible light, but they do shine at much longer infrared wavelengths. And Herschel can observe much longer infrared wavelengths than any space telescope before (up to 672 microns). Herschel also has 16 times the collecting area, and hence 16 times better resolution, than previous infrared space telescopes. That lets it resolve details with unprecedented clarity. Together, these abilities open a new window onto the universe. Herschel launched in May from the Guiana Space Centre in French Guiana aboard a European Space Agency Ariane 5 rocket. Since then, it has expanded the number of distant galaxies observed at far infrared wavelengths from a few hundred to more than 28,000. And with the instrument testing and system check-out phases finally completed, the discoveries are only now beginning. Beyond simply imaging these dark objects, Herschel can identify the presence of chemicals such as carbon monoxide and water based on their spectral fingerprints. “We will be able to decipher the chemistry of what's going on during the beginnings of star formation, in the discs of dust and gas that form planets, and in the lingering aftermath of stellar explosions,” Helou says. Herschel is a European Space Agency mission, with science instruments provided by a consortium of European-led institutes and with important participation by NASA. See the ESA Herschel site at sci.esa.int/science-e/www/area/index.cfm?fareaid=16. Also, see the NASA sites at herschel.jpl.nasa.gov, www.herschel.caltech.edu, and www.nasa.gov/mission_pages/herschel. Kids can learn about infrared light by browsing through the Infrared Photo Album at The Space Place, spaceplace.nasa.gov/en/kids/sirtf1/sirtf_action.shtml. This article was provided courtesy of the Jet Propulsion Laboratory, California Institute of Technology, under a contract with the National Aeronautics and Space Administration. These images are TES ozone plots viewed with Google Earth. Colors map to tropospheric ozone concentrations. The image on the left shows ozone concentrations at an altitude of approximately 32,000 feet, while the one on the right shows ozone at approximately 10,000 feet. The measurements are monthly averages over each grid segment for December 2004. When it comes to notorious greenhouse gases, carbon dioxide is like Al Capone—always in the headlines. Meanwhile, ozone is more like Carlo Gambino—not as famous or as powerful, but still a big player. After tracking this lesser-known climate culprit for years, NASA’s Tropospheric Emission Spectrometer (TES) has found that ozone is indeed a shifty character. Data from TES show that the amount of ozone—and thus its contribution to the greenhouse effect—varies greatly from place to place and over time. "Ozone tends to be localized near cities where ozone precursors, such as car exhaust and power plant exhaust, are emitted," says Kevin Bowman, a senior member of the TES technical staff at the Jet Propulsion Laboratory. But the ozone doesn't necessarily stay in one place. Winds can stretch the ozone into long plumes. "Looking out over the ocean we can see ozone being transported long distances over open water." Unlike CO2, ozone is highly reactive. It survives in the atmosphere for only a few hours or a few days before it degrades and effectively disappears. So ozone doesn't have time to spread out evenly in the atmosphere the way that CO2 does. The amount of ozone in one place depends on where ozone-creating chemicals, such as the nitrogen oxides in car exhaust. are being released and which way the wind blows. This short lifespan also means that ozone could be easier than CO2 to knock off. "If you reduce emissions of things that generate ozone, then you can have a quicker climate effect than you would with CO2," Bowman says. "From a policy standpoint, there’s been a lot of conversation lately about regulating short-lived species like ozone." To be clear, Bowman isn’t talking about the famous "ozone layer." Ozone in this high-altitude layer shields us from harmful ultraviolet light, so protecting that layer is crucial. Bowman is talking about ozone closer to the ground, so-called tropospheric ozone. This "other" ozone at lower altitudes poses health risks for people and acts as a potent greenhouse gas. TES is helping scientists track the creation and movement of low-altitude ozone over the whole planet each day. "We can see it clearly in our data," Bowman says. Countries will need this kind of data if they decide to go after the heat-trapping gas. Ozone has been caught red-handed, and TES is giving authorities the hard evidence they need to prosecute the case. Learn more about TES and its atmospheric science mission at tes.jpl.nasa.gov. The Space Place has a fun “Gummy Greenhouse Gases” activity for kids that will introduce them to the idea of atoms and molecules. Check it out at spaceplace.nasa.gov/en/kids/tes/gumdrops. X-9 class solar flare December 6, 2006, as seen by GOES-13's Solar X-ray Imager. It was one of the strongest flares in the past 30 years. 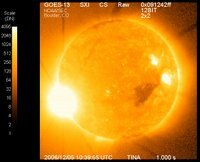 In December 2006, an enormous solar flare erupted on the Sun's surface. The blast hurled a billion-ton cloud of gas (a coronal mass ejection, or CME) toward Earth and sparked days of intense geomagnetic activity with Northern Lights appearing across much of the United States. While sky watchers enjoyed the show from Earth's surface, something ironic was happening in Earth orbit. At the onset of the storm, the solar flare unleashed an intense pulse of X-rays. The flash blinded the Solar X-Ray Imager (SXI) on NOAA's GOES-13 satellite, damaging several rows of pixels. SXI was designed to monitor solar flares, but it must also be able to protect itself in extreme cases. That's why NASA engineers gave the newest Geostationary Operational Environmental Satellite a new set of sophisticated “sunglasses.” The new GOES-14 launched June 27 and reached geosynchronous orbit July 8. Its “sunglasses” are a new flight-software package that will enable the SXI sensor to observe even intense solar flares safely. Radiation from these largest flares can endanger military and civilian communications satellites, threaten astronauts in orbit, and even knock out cities' power grids. SXI serves as an early warning system for these flares and helps scientists better understand what causes them. “We wanted to protect the sensor from overexposure, but we didn't want to shield it so much that it couldn't gather data when a flare is occurring,” says Cynthia Tanner, SXI instrument systems manager for the GOES-NOP series at NASA's Goddard Space Flight Center in Greenbelt, Maryland. (GOES-14 was called GOES-O before achieving orbit). Shielding the sensor from X-rays also reduces the amount of data it can gather about the flare. It's like stargazing with dark sunglasses on. So NASA engineers must strike a balance between protecting the sensor and gathering useful data. When a dangerous flare occurs, the new SXI sensor can protect itself with five levels of gradually “darker” sunglasses. Each level is a combination of filters and exposure times carefully calibrated to control the sensor's exposure to harmful high-energy X-rays. As the blast of X-rays from a major solar flare swells, GOES-14 can step up the protection for SXI through these five levels. The damaged sensor on GOES-13 had only two levels of protection — low and high. Rather than gradually increasing the amount of protection, the older sensor would remain at the low level of protection, switching to the high level only when the X-ray dose was very high. Forecasters anticipate a new solar maximum in 2012-2013, with plenty of sunspots and even more solar flares. “GOES-14 is ready,” says Tanner. For a great kid-level explanation of solar “indigestion” and space weather, check out spaceplace.nasa.gov/en/kids/goes/spaceweather. 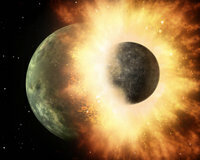 Artist's rendering of cosmic collision involving two objects whose combined mass was at least twice that of our Moon. Discovered using the Spitzer Space Telescope in the planetary system of a star called HD 172555 100 light-years away. Two small planets hurtle toward each other at 22,000 miles per hour. They're on a collision course. With unimaginable force, they smash into each other in a flash of light, blasting streams of molten rock far out into space. This cataclysmic scene has happened countless times in countless solar systems. In fact, scientists think that such collisions could have created Earth's moon, tilted Uranus on its side, set Venus spinning backward, and sheared the crust off Mercury. But witnessing such a short-lived collision while pointing your telescope in just the right direction would be a tremendous stroke of luck. Well, astronomers using NASA's Spitzer space telescope recently got lucky. “It's unusual to catch such a collision in the act, that's for sure,” said Geoffrey Bryden, A cosmic Crashspitzer_an astronomer specializing in extrasolar planet formation at NASA's Jet Propulsion Laboratory and a member of the science team that made the discovery. When Bryden and his colleagues pointed Spitzer at a star 100 light-years away called HD 172555, they noticed something strange. Patterns in the spectrum of light coming from nearby the star showed distinctive signs of silicon monoxide gas — huge amounts of it — as well as a kind of volcanic rock called tektite. It was like discovering the wreckage from a cosmic car crash. The silicon monoxide was produced as the high-speed collision literally vaporized huge volumes of rock, which is made largely of silicon and oxygen. The impact also blasted molten lava far out into space, where it later cooled to form chunks of tektite. Based on the amount of silicon monoxide and tektites, Bryden's team calculated that the colliding planetary bodies must have had a combined mass more than twice that of Earth's moon. The collision probably happened between 1,000 and 100,000 years ago — a blink of an eye in cosmic terms. The scientists used the Spitzer space telescope because, unlike normal telescopes, Spitzer detects light at invisible, infrared wavelengths. Bryden says the discovery provides further evidence that planet-altering collisions are more common in other star systems than people once thought. The “crash-bang” processes at work in our own solar system may indeed be universal. If so, Spitzer has a front row seat on a truly smashing show. See Spitzer Space Telescope's brand new Web site at http://spitzer.caltech.edu/. Kids can learn about infrared light and see beautiful Spitzer images by playing the new Spitzer Concentration game at http://spaceplace.jpl.nasa.gov/en/kids/spitzer/concentration. The Geostationary Lightning Mapper (GLM) on the next generation of GOES satellites will detect the very rapid and transient bursts of light produced by lightning at near-infrared wavelengths. This image was taken from the International Space Station and shows the Aurora Australis and lightning. There's something mesmerizing about watching a thunderstorm. You stare at the dark, dramatic clouds waiting for split-second bursts of brilliant light — intricate bolts of lightning spidering across the sky. Look away at the wrong time and (FLASH!) you miss it. Strong vertical motions within a storm cloud help generate the electricity that powers lightning. These updrafts are caused when warm, moist air rises. Because warmth and lightning are inextricably connected, tracking long-term changes in lightning frequency could reveal the progress of climate change. It's one of many reasons why scientists want to keep an unwavering eye on lightning. The best way to do that? With a satellite 35,800 km overhead. At that altitude, satellites orbit at just the right speed to remain over one spot on the Earth's surface while the planet rotates around its axis — a “geostationary” orbit. NASA and NOAA scientists are working on an advanced lightning sensor called the Geostationary Lightning Mapper (GLM) that will fly onboard the next generation geostationary operational environmental satellite, called GOES-R, slated to launch around 2015. “GLM will give us a constant, eye-in-the-sky view of lightning over a wide portion of the Earth,” says Steven Goodman, NOAA chief scientist for GOES-R at NASA's Goddard Space Flight Center. Once GLM sensors are flying on GOES-R and its sister GOES-S, that view will extend 18,000 km from New Zealand, east across the Pacific Ocean, across the Americas, and to Africa's western coast. 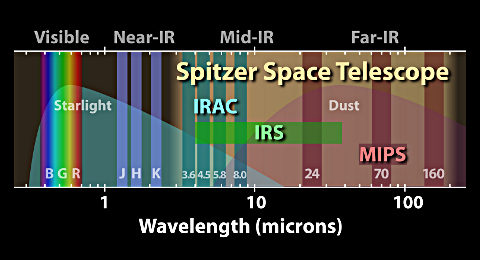 The “warm mission” of the Spitzer Space Telescope will still be able to use two sensors in its Infrared Array Camera (IRAC) to continue its observations of the infrared universe. 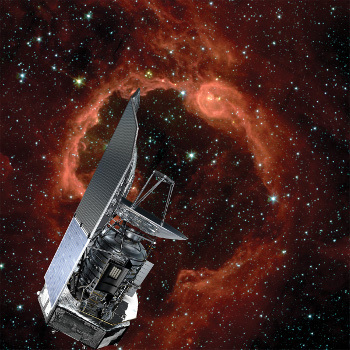 The Spitzer Space Telescope is getting a second chance at life. The liquid helium “lifeblood” that flows through the telescope has finally run out, bringing Spitzer's primary mission to an end. But a new phase of this infrared telescope's exploration of the universe is just beginning. Even without liquid helium, which cooled the telescope to about 2 degrees above absolute zero (-271°C), Spitzer will continue to do important research — some of which couldn't easily be done during its primary mission. For example, scientists will use Spitzer's “second life” to explore the rate of expansion of the universe, study variable stars, and search for near-Earth asteroids that could pose a threat to our planet. Launched in August 2003 as the last of NASA's four Great Observatories, Spitzer specializes in observing infrared light, which is invisible to normal, optical telescopes. That gives Spitzer the power to see relatively dark, cool objects such as planet-forming discs or nearby asteroids. These objects are too cold to emit light at visible wavelengths, but they're still warm enough to emit infrared light. In fact, all warm objects “glow” with infrared light — even telescopes. That's why Spitzer had to be cooled with liquid helium to such a low temperature. Otherwise, it would be blinded by its own infrared glow. As the helium expires, Spitzer will warm to about 30 degrees above absolute zero (–243°C). At that temperature, the telescope will begin emitting long-wavelength infrared light, but two of its short-wavelength sensors will still work perfectly. And with more telescope time available for the remaining sensors, mission managers can more easily schedule new research proposals designed for those sensors. For example, scientists have recently realized how to use infrared observations to improve our measurements of the rate of expansion of the universe. And interest in tracking near-Earth objects has grown in recent years — a task for which Spitzer is well suited. “Science has progressed, and people always have new ideas,” Werner says. In its second life, Spitzer will help turn those ideas into new discoveries. For kids, The Space Place Web site has a fun typing game using Spitzer and infrared astronomy words. Check it out at spaceplace.nasa.gov/en/kids/spitzer/signs. Artist's rendering of dwarf planet MakeMake, discovered around Easter 2005. Unlikely to gain acceptance their nickname Easterbunny, the discoverers named it for the god of humanity in the mythology of Easter Island. You know Uranus, Neptune, and Pluto. But how about their smaller cousins Eris, Ceres, Orcus, and Makemake? How about Easterbunny? These are all names given to relatively large “planet-like” objects recently found in the outer reaches of our solar system. Some were just temporary nicknames, others are now official and permanent. Each has a unique story. Nearby planets such as Venus and Mars have been known since antiquity and were named by the ancient Romans after their gods. In modern times, though, who gets to name newly discovered dwarf planets and other important solar-system bodies? In short, whoever finds it names it. For example, a few days after Easter 2005, Brown and his colleagues discovered a bright dwarf planet orbiting in the Kuiper belt. The team's informal nickname for this new object quickly became Easterbunny. However, ever since its formation in 1919, the International Astronomical Union (IAU) ultimately decides whether to accept or reject the name suggested by an object's discoverers. "Easterbunny" probably wouldn't be approved. According to IAU guidelines, comets are named after whoever discovered them—such as comet Hale-Bopp, named after its discoverers Alan Hale and Thomas Bopp. Asteroids can be named almost anything. 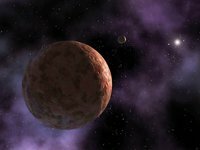 IAU rules state that objects in the Kuiper belt should be given mythological names related to creation. So Brown's team started brainstorming. They considered several Easter-esque names: Eostre, the pagan mythological figure that may be Easter's namesake; Manabozho, the Algonquin rabbit trickster god. In the end, they settled on Makemake (pronounced MAH-kay MAH-kay), the creator of humanity in the mythology of Easter Island, so named because Europeans first arrived there on Easter 1722. Other names have other rationales. The dwarf planet discovered in 2005 that triggered a fierce debate over Pluto's status was named Eris, for the Greek goddess of strife and discord. Another dwarf planet with an orbit that mirrors Pluto's was dubbed Orcus, a god in Etruscan mythology that, like Pluto, ruled the underworld. Brown says he takes “this naming business” very seriously and probably spends too much time on it. “But I enjoy it.” More tales of discovery and naming may be found in Brown's blog MikeBrownsPlanets.com. Constellations have also been named after ancient gods, human figures, and animals. Kids can start to learn their constellations by making a Star Finder for this month at spaceplace.nasa.gov/en/kids/st6starfinder/st6starfinder.shtml. There you will also find a handy explanation of why astrology has no place in science. 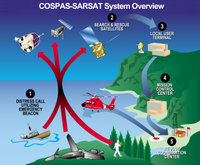 NOAA's polar-orbiting and geostationary satellites, along with Russia's Cospas spacecraft, are part of the sophisticated, international Search and Rescue Satellite-Aided Tracking System. If a plane crashes in the woods and nobody hears it, does it make a sound? Never mind contemplating this scenario as a philosophical riddle. This can be a real life or death question. And the answer most of the time is that, even if no people are nearby, something is indeed listening high above. That something is a network of satellites orbiting about 450 miles overhead. The “sound” they hear isn't the crash itself, but a distress signal from a radio beacon carried by many modern ships, aircraft, and even individual people venturing into remote wildernesses. In the last 25 years, more than 25,000 lives have been saved using the satellite response system called Search and Rescue Satellite-Aided Tracking (SARSAT). So what are these life-saving superhero satellites? Why, they are mild-mannered weather satellites. In February, NASA launched the newest of these Polar-orbiting Operational Environmental Satellites (or POES) into orbit. This new satellite, called N-Prime at launch and now dubbed NOAA-19, prevents a gap in this satellite network as another, aging NOAA satellite reached the end of its operational life. “The launch of N-Prime was a big deal for us,” Fitzmaurice says. With N-Prime/NOAA-19 in place, there are now six satellites in this network. Amongst them, they pass over every place on Earth, on average, about once an hour. To pinpoint the location of an injured explorer, a sinking ship, or a downed plane, POES use the same Doppler effect that causes a car horn to sound higher-pitched when the car is moving toward you than it sounds after it passes by. In a similar way, POES “hear” a higher frequency when they're moving toward the source of the distress signal, and a lower frequency when they've already passed overhead. It takes only three distress-signal bursts — each about 50 seconds apart — to determine the source's location. Complementing the POES are the Geostationary Operational Environmental Satellites (GOES), which, besides providing weather data, continuously monitor the Western Hemisphere for distress signals. Since their geostationary orbit leaves them motionless with respect to Earth below, there is no Doppler effect to pinpoint location. However, they do provide near instantaneous notification of distress signals. In the future, the network will be expanded by putting receivers on new Global Positioning System (GPS) satellites, Fitzmaurice says. “We want to be able to locate you after just one burst.” With GPS, GOES will also be able to provide the location of the transmitter. Philosophers beware: SARSAT is making “silent crashes” a thing of the past. Download a two-page summary of NOAA-19 at www.osd.noaa.gov/POES/NOAA-NP_Fact_Sheet.pdf. The Space Place gives kids a chance to rescue stranded skiers using their emergency rescue beacons. The Wild Weather Adventure game awaits them at spaceplace.nasa.gov/en/kids/goes/wwa. Do alien planets around other stars have the right ingredients for a pre-biotic soup? Alien life on distant worlds. What would it be like? For millennia people could only wonder, but now NASA's Spitzer Space Telescope is producing some hard data. It turns out that life around certain kinds of stars would likely be very different from life as we know it. Using Spitzer, astronomers have discovered the organic chemical acetylene in the planet-forming discs surrounding 17 M-dwarf stars. It's the first time any chemical has been detected around one of these small, cool stars. However, scientists are more intrigued by what was not there; a chemical called hydrogen cyanide (HCN), an important building block for life as we know it. “The fact that we do not detect hydrogen cyanide around cool stars suggests that that prebiotic chemistry may unfold differently on planets orbiting cool stars,” says Ilaria Pascucci, lead scientist for the Spitzer observations and an astrophysicist at Johns Hopkins University in Baltimore, Maryland. To search for HCN, Pascucci's team looked at data from Spitzer, which observes the universe at infrared wavelengths. Planet-forming discs around M-dwarf stars have very faint infrared emissions, but Spitzer is sensitive enough to detect them. HCN's distinctive 14-micron emission band was absent in the infrared spectra of the M-dwarf stars, but Spitzer did detect HCN in the spectra of 44 hotter, sun-like stars. Infrared astronomy will be a powerful tool for studying other prebiotic chemicals in planet-forming discs, says Pascucci, and the Spitzer Space Telescope is at the forefront of the field. Spitzer can't yet draw us a picture of alien life forms, but it's beginning to tell us what they could—and could not—be made of. “That's pretty wonderful, too,” says Pascucci. For news of other discoveries based on Spitzer data, visit www.spitzer.caltech.edu. Kids can learn Spitzer astronomy words and concepts by playing the Spitzer “Sign Here!” game at spaceplace.nasa.gov/en/kids/spitzer/signs.